In the aftermath of a growing wave of general Islamic fear and hatred, there may well be a number of Muslim children who are scared and confused about why they are being persecuted when they did nothing wrong – or why their parents are under such scrutiny by neighbors and friends. While the lazy excuse for this may be that America was founded on Judeo-Christian principles, the real reason could just be ignorance and fear because the large majority of terror attacks in the world over the last couple decades have been committed by Muslims who have a literal (or known as “radical”) ideology and interpretation of the teachings of the Qu’ran. It is unfortunate that general ignorance about Islam leads to this fear of Islam because of a few “bad apples” who lay claim to adhering to “fundamentalist” Islam. Islam is a religion that has some inherent difficulty assimilating to life in a free America, and it’s also difficult to live an Islamic life in a society that does not understand your faith and the lifestyle that usually comes with it. And it can be tough in these situations, especially for children in Islam, to live with pride in their religious and cultural heritage, and thus easier to “fit in” by adopting and assimilating to the Judeo-Christian ethos or the secularist ethic that seems to predominate in America. More than 50 years ago, however, a Muslim couple (actually the wife converted to Islam from Methodist Christian) opened a Muslim Youth Camp in northern California, designed to unite Muslim children and help them embrace their faith and live harmoniously in America. 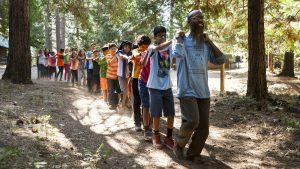 The camp is located in the woods of northern California, and it looks and acts much like any other summer camp you may find. There are games, activities, music, and swimming – many of the activities that campers of all stripes would experience during the summer. Entire families will often participate, with parents being involved in adult classes and counseling sessions with other parents to support each other with the challenges of Muslim living, and children are grouped by age with various other classes and activities, and campers come from all over the world for the experience. This youth camp is getting some publicity in the mainstream these days, mostly in the wake of anti-Muslim sentiment, and this camp is being portrayed as an “escape” for Muslims to find some camaraderie and support to be able to stand up in the face of irrational hatred and remain committed and proud of their culture and faith and understand that Islam is not inherently to blame for the carnage that is being tied to the religion. This entry was posted in General on September 8, 2017 by Vicki Black.